There are a lot of instances when you want to address a large number of people. Let's say you're an organizer of a parade or rally, and you are trying to get people's attention. Yelling at the top of your lungs won't be very effective. Or you need that your voice is heard over a large distance, like a lifeguard at the beach. In all these cases, a megaphone will come in handy. 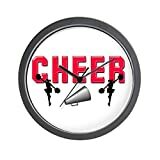 You can also use it indoors: for example, in school when you have to get the students' attention, or if you're a cheerleader at a basketball game. There are a number of different models, and you have to know how to choose. Acoustic: This is a “director” type megaphone. It is essentially a cardboard or plastic cone, with a handle. It might get the job done for directing a school play, or something else where you are dealing with a small crowd. (On the other hand, Thomas Edison invented a megaphone that could amplify a whisper to be heard at a distance of 1000 feet!) 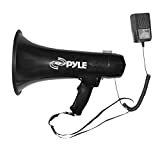 It is also recommended when there is humidity or moisture that can ruin the electronics of an electric megaphone. Built-in: Here the microphone is built into the megaphone. You put the megaphone to your mouth, and speak. Hand-held: Here the microphone is attached separately. You speak into the microphone, and the sound goes out through the loudspeaker section. The advantage here is that the speaker's face is still visible. Weight: Since you have to carry the megaphone with you, the weight is a consideration. The acoustic megaphone is of course much lighter than the electric versions. But even among the electric ones, the batteries add to the weight. 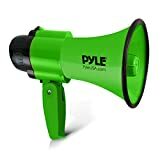 The Pyle megaphone's rechargeable battery is a lightweight alternative to disposable batteries. 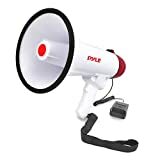 Replacement for a sound system: A megaphone is an inexpensive alternative to an entire sound system. 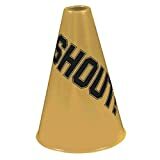 Some said that using a megaphone was 1/5 the cost of a public address system. Delicate buttons: With the CampCo Uzi mini-megaphone, some noticed that the gadget would be on, even when they thought they had turned it off. This is because the buttons are delicate and can be turned on by mistake. So it's worth noting that, so as not to drain the batteries. 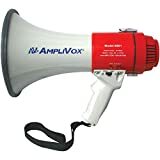 Battery-powered: You should take note of the battery power that your megaphone requires. 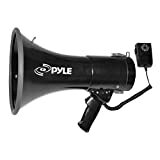 The Croove megaphone bullhorn requires 4 D batteries. (Some can make do with “C” batteries.) It also has an On/Off switch, so you can save power when it's not in use. The Pyle PMP57LIA has a built-in rechargeable battery—it can also run on 8 “C” batteries. Built-in sounds: Some megaphones have built-in sounds, such as a siren or famous songs. 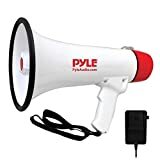 The Pyle Megaphone has room for a USB flash memory, SD memory card, MP3 player, iPhone, Tablet, and more, so you can play a whole variety of sounds or music. Power: Take note of the power of the megaphone that you need. 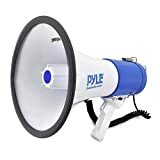 The Croove Megaphone has 30 Watts of sound, and can cover 800 yards, while the Pyle PMP57LIA has 50 Watts of power and can be heard for 1200 yards. Volume Control: It's handy to have a volume control on your megaphone. The sound requirements are not the same when you're indoors as when you're outdoors. 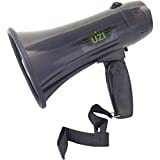 Recording: The CampCo Uzi Ultra Mini Megaphone has a recording and playback feature. This way, you don't have to yell the same thing again and again. You can just record yourself once and play it back. You can record a message, attach the megaphone to your car, and then travel around, making the announcement to your neighborhood. 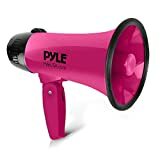 Pyle—was founded in the 1960s, originally making speaker equipment. They sell replacement speakers and car audio systems. They now have separate divisions for audio for car, for the home, and for professional use (Djs, musicians, etc.). They also make microphones, rechargeable batteries, and more. Their headquarters is in Brooklyn, New York. Croove—are manufacturers and distributors of audio products, as well as electronic devices. They make microphones, speakers, and megaphones. 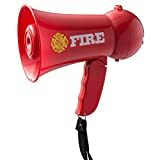 Their megaphone has a power of 30 Watts, and its sound can cover 800 yards. Bulk Buys—are retailers of arts & crafts products, and sports and fitness goods. 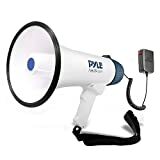 Their megaphone is inexpensive, compact, and is perfect for working with smaller crowds. CampCo—is a reseller of camping and outdoors goods from the biggest companies. They make tactical products, such as army knives, cameras, holsters, stun devices, and watches.